Top plate or stem fixing. Wheel diameters from 35mm to 125mm. Load ranges from 50kg up to 460kg per castor. 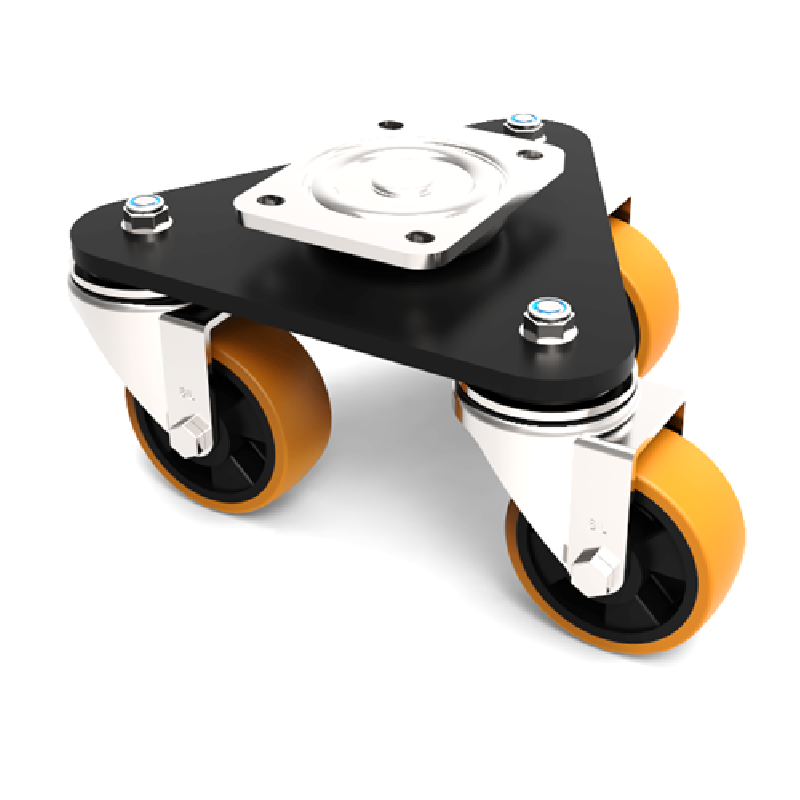 Central medium duty swivel head, mounted on a triangular base plate fitted with 3 pressed steel swivel castors fitted with 35mm brown 92 shore A polyurethane tyre steel centred wheels with ball bearings. 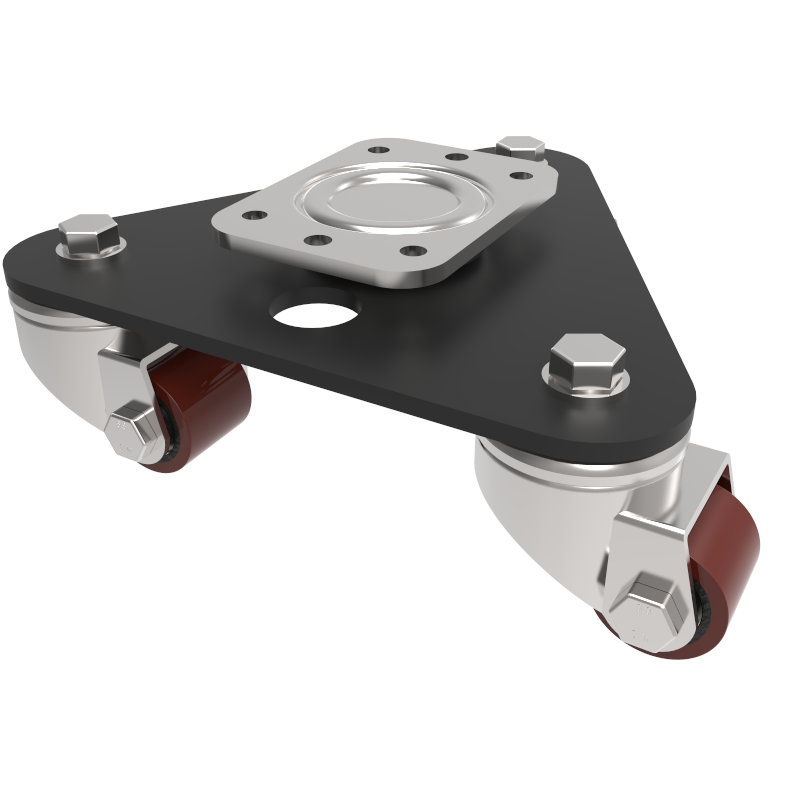 Overall height 84mm, Mounting Plate size 115 x 85mm, hole centres 80 x 60mm, Load capacity 250kg. Central medium duty swivel head, mounted on a triangular base plate fitted with 3 pressed steel swivel castors fitted with 40mm white nylon wheels with ball bearings. Overall height 91mm, Mounting Plate size 115 x 85mm, hole centres 80 x 60mm, Load capacity 250kg. Central medium duty swivel head, mounted on a triangular base plate fitted with 3 pressed steel swivel castors fitted with 50mm white nylon wheels with ball bearings. Overall height 99mm, Mounting Plate size 115 x 85mm, hole centres 80 x 60mm, Load capacity 250kg. Central medium duty swivel head, mounted on a triangular base plate fitted with 3 pressed steel swivel castors fitted with 65mm white nylon wheels with ball bearings. Overall height 114mm, Mounting Plate size 115 x 85mm, hole centres 80 x 60mm, Load capacity 250kg. Central medium duty swivel head mounted on a triangular base plate fitted with 3 pressed steel swivel castors fitted with a white nylon wheel with roller bearings. Wheel diameter 100mm, tread width 32mm, overall height 164mm. Load capacity 460kg. Central medium duty swivel head mounted on a triangular base plate fitted with 3 pressed steel swivel castors fitted with a white nylon wheel with roller bearings. Wheel diameter 125mm, tread width 32mm, overall height 193mm. Load capacity 460kg. Central medium duty swivel head mounted on a triangular base plate fitted with 3 pressed steel swivel castors fitted with a white nylon wheel with a single ball bearings. Wheel diameter 100mm, tread width 36mm, overall height 164mm. Load capacity 460kg. 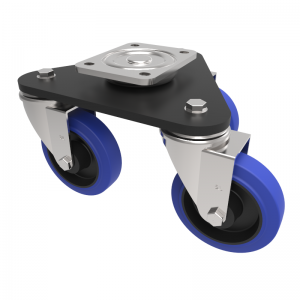 Central medium duty swivel head mounted on a triangular base plate fitted with 3 pressed steel swivel castors fitted with blue elastic 65 shore A rubber tyred black nylon centred wheels with roller bearings. Wheel diameter 100mm, tread width 36mm, overall height 164mm. Load capacity 450kg. Central medium duty swivel head mounted on a triangular base plate fitted with 3 pressed steel swivel castors fitted with a white nylon wheel with a single ball bearings. Wheel diameter 125mm, tread width 37mm, overall height 193mm. Load capacity 460kg. Central medium duty swivel head mounted on a triangular base plate fitted with 3 pressed steel swivel castors fitted with a white nylon wheel with roller bearings. Wheel diameter 80mm, tread width 35mm, overall height 147mm. Load capacity 460kg. 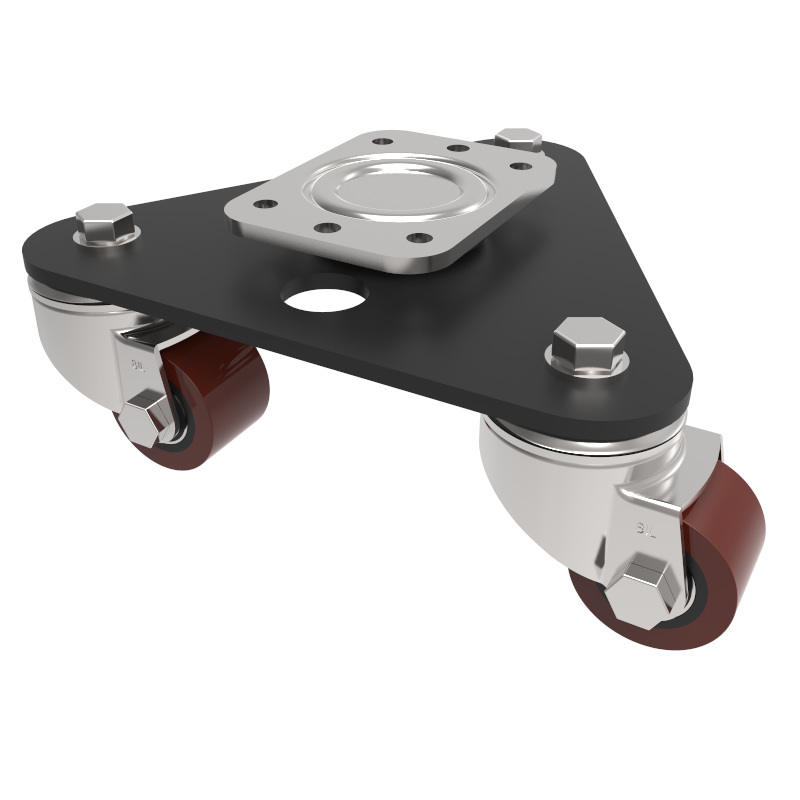 Central medium duty swivel head, mounted on a triangular base plate fitted with 3 pressed steel swivel castors fitted with 40mm brown 92 shore A polyurethane tyre steel centred wheels with ball bearings. Overall height 91mm, Mounting Plate size 115 x 85mm, hole centres 80 x 60mm, Load capacity 250kg. Central medium duty swivel head mounted on a triangular base plate fitted with 3 pressed steel swivel castors fitted with blue elastic 65 shore A rubber tyred black nylon centred wheels with single ball bearing. Wheel diameter 100mm, tread width 36mm, overall height 164mm. Load capacity 450kg. Central medium duty swivel head mounted on a triangular base plate fitted with 3 pressed steel swivel castors fitted with a blue elastic 65 shore A rubber tyred black nylon centred wheel with roller bearings. Wheel diameter 80mm, tread width 35mm, overall height 147mm. Load capacity 450kg. Central medium duty swivel head, mounted on a triangular base plate fitted with 3 pressed steel swivel castors fitted with 40mm white nylon wheels with ball bearings. Overall height 101mm, Plate size 138 x 109mm, hole centres 105 x 80mm Load capacity 360kg. Central medium duty swivel head, mounted on a triangular base plate fitted with 3 pressed steel swivel castors fitted with 50mm white nylon wheels with ball bearings. Overall height 109mm, Plate size 138 x 109mm, hole centres 105 x 80mm Load capacity 360kg. Central medium duty swivel head mounted on a triangular base plate fitted with 3 pressed steel swivel castors fitted with blue elastic 65 shore A rubber tyred black nylon centred wheels with single ball bearings. 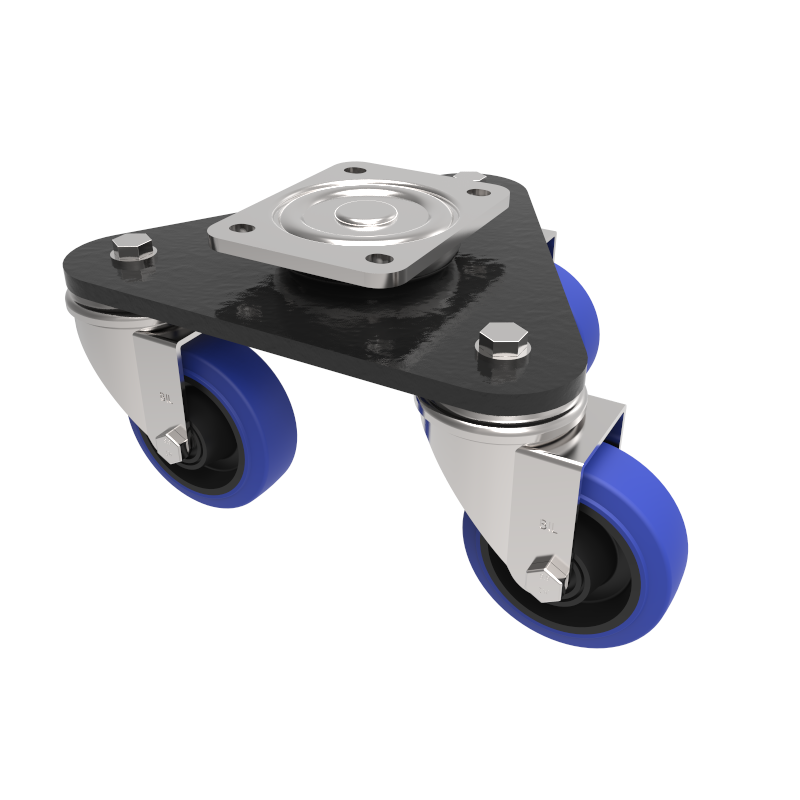 Wheel diameter 80mm, tread width 35mm, overall height 147mm. Load capacity 330kg. 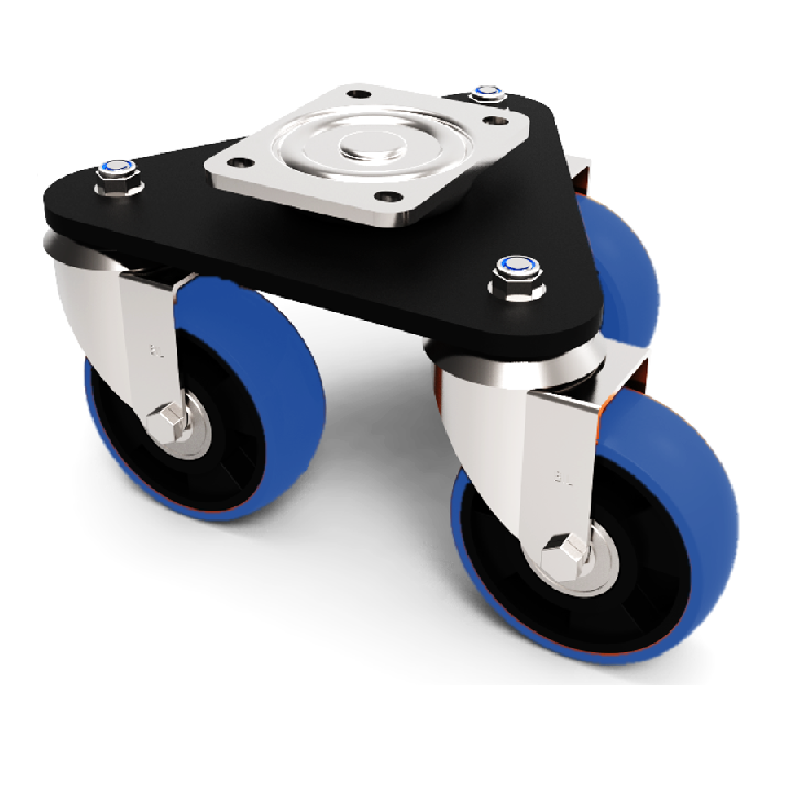 Central medium duty swivel head mounted on a triangular base plate fitted with 3 pressed steel swivel castors fitted with blue elastic 65 shore A rubber tyred black nylon centred wheels with roller bearings. Wheel diameter 125mm, tread width 36mm, overall height 193mm. Load capacity 450kg. Central medium duty swivel head mounted on a triangular base plate fitted with 3 pressed steel swivel castors fitted with blue elastic 65 shore A rubber tyred black nylon centred wheels with single ball bearing. Wheel diameter 125mm, tread width 36mm, overall height 193mm. Load capacity 450kg. Central medium duty swivel head, mounted on a triangular base plate fitted with 3 pressed steel swivel castors fitted with 50mm brown 92 shore A polyurethane tyre steel centred wheels with ball bearings. Overall height 99mm, Mounting Plate size 115 x 85mm, hole centres 80 x 60mm, Load capacity 250kg. 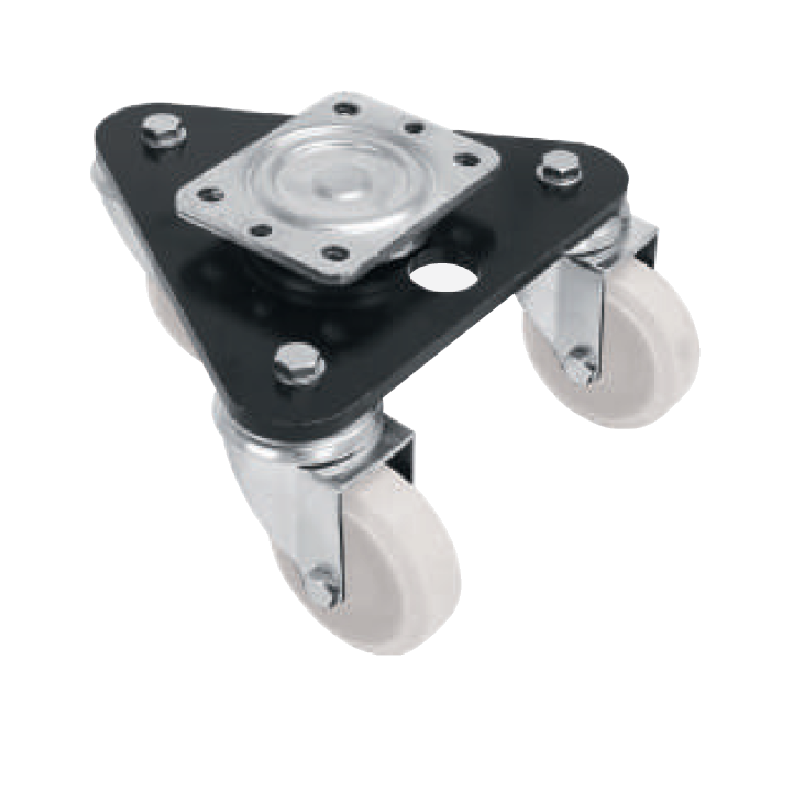 Central medium duty swivel head, mounted on a triangular base plate fitted with 3 pressed steel swivel castors fitted with 65mm white nylon wheels with ball bearings. Overall height 124mm, Plate size 138 x 109mm, hole centres 105 x 80mm Load capacity 460kg. 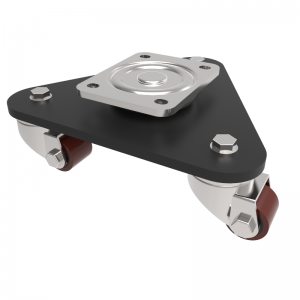 Central medium duty swivel head mounted on a triangular base plate fitted with 3 pressed steel swivel castors fitted with brown polyurethane tyred black nylon centred wheels with roller bearings. Wheel diameter 100mm, tread width 40mm, overall height 164mm. Load capacity 460kg. 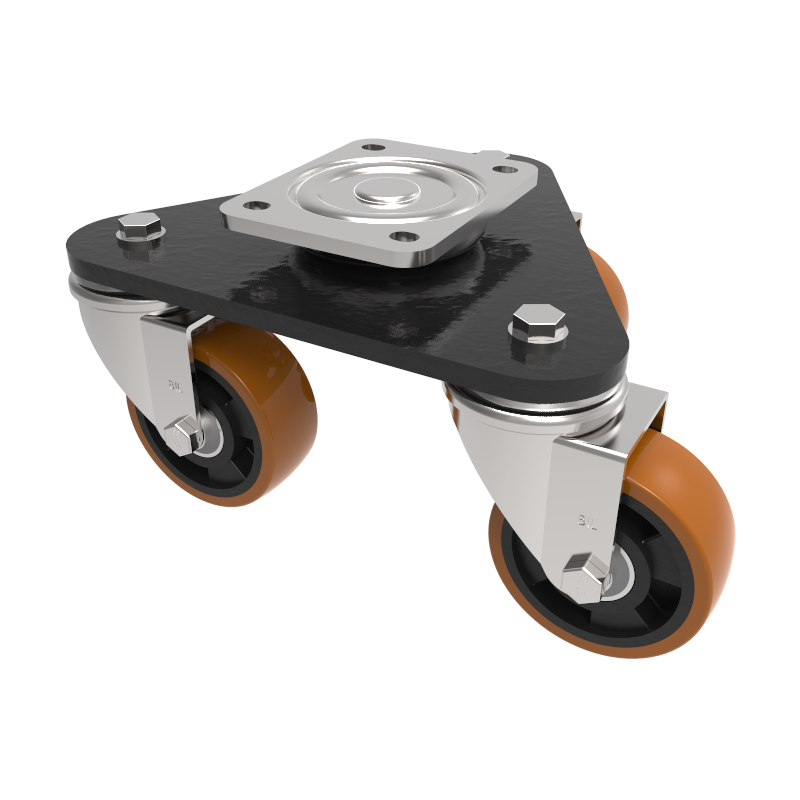 Central medium duty swivel head, mounted on a triangular base plate fitted with 3 pressed steel swivel castors fitted with 35mm brown 92 shore A polyurethane tyre steel centred wheels with ball bearings. 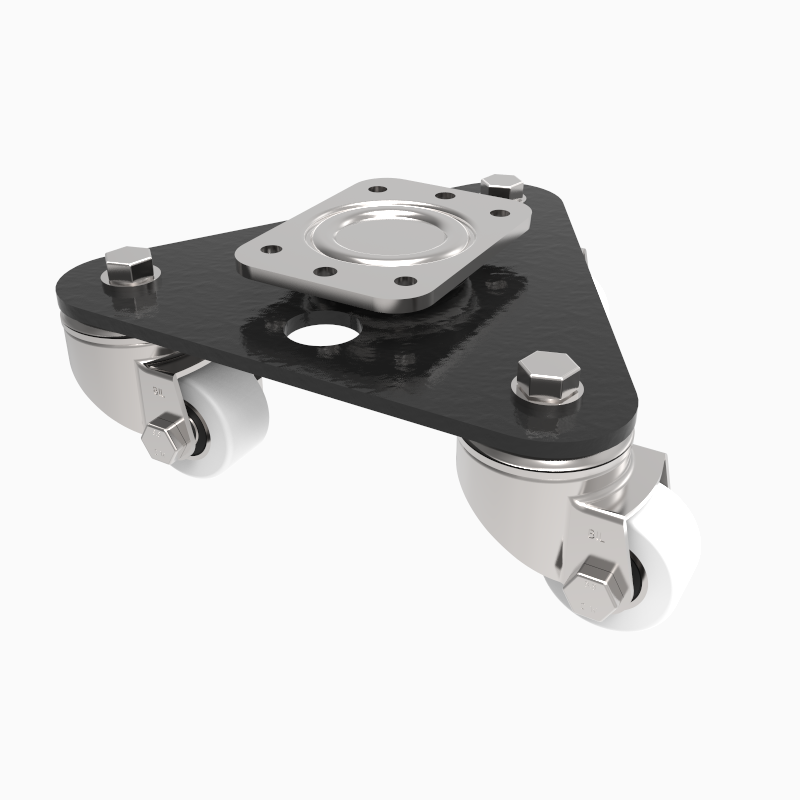 Overall height 84mm, Mounting Plate size 85 x 85mm, hole centres 55 x 55mm to suit a 10mm bolt. Load capacity 300kg. 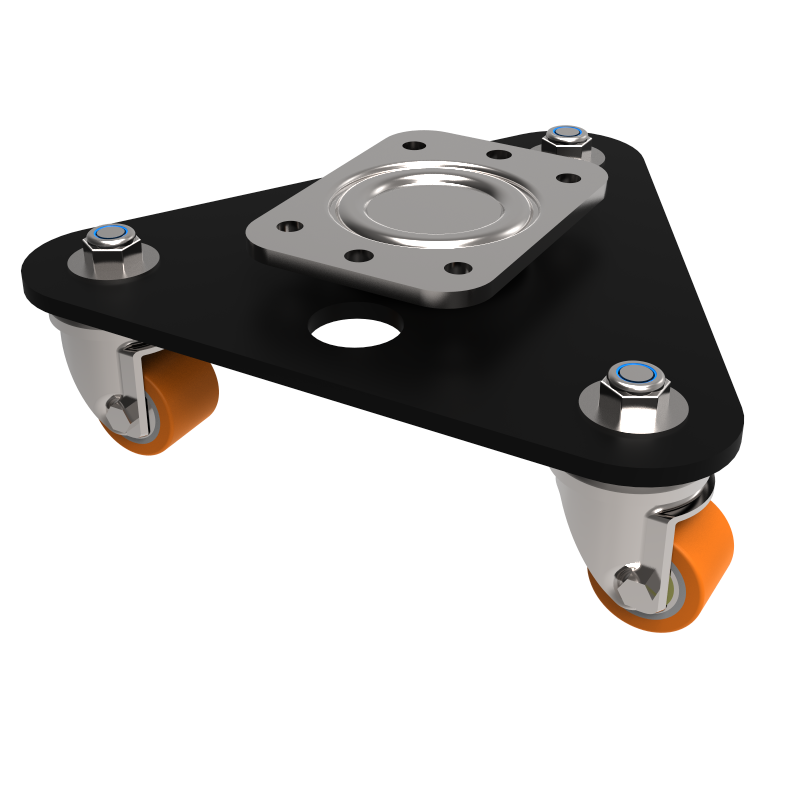 Central medium duty swivel head, mounted on a triangular base plate fitted with 3 pressed steel swivel castors fitted with 40mm polyurethane tyre steel centred wheels with ball bearings. Overall height 101mm, Plate size 138 x109mm, hole centres 105 x 80mm, Load capacity 360kg. 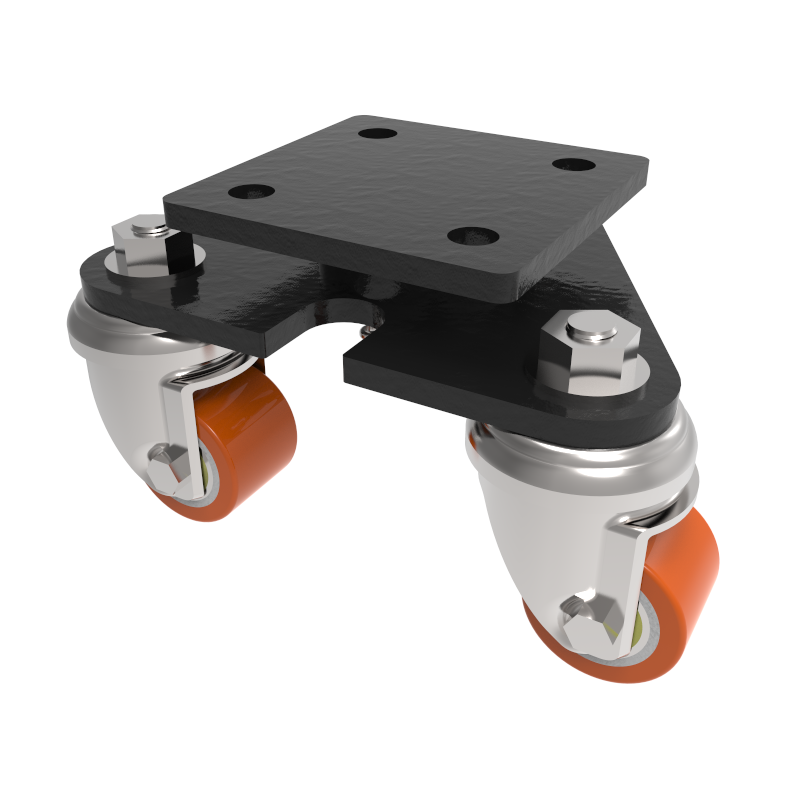 Scenery Skate Central medium duty swivel head mounted on a triangular base plate fitted with 3 pressed steel swivel castors fitted with brown polyurethane tyred black nylon centred wheels with ball bearings. 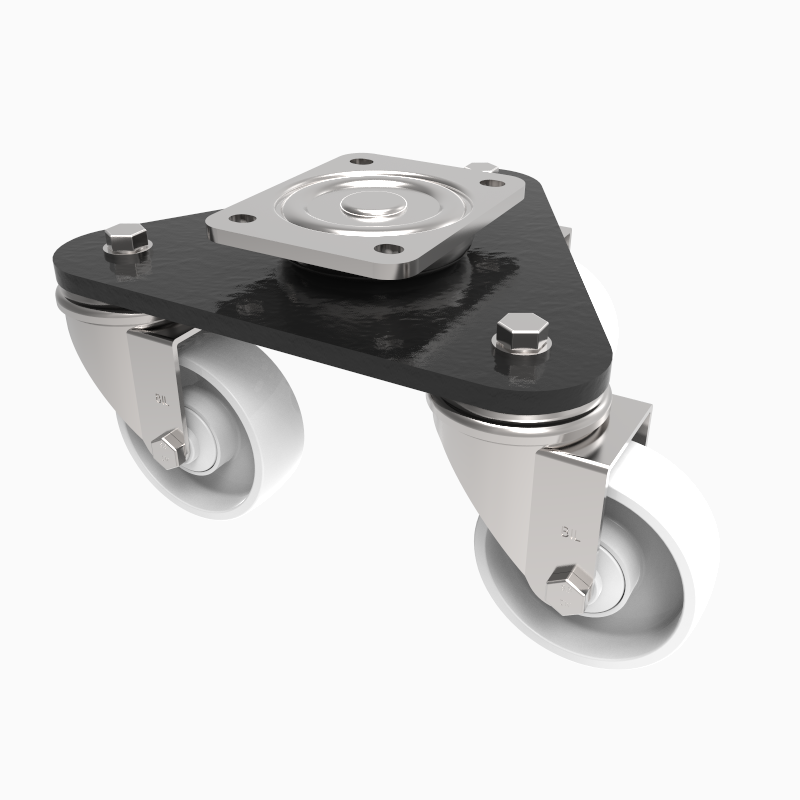 Wheel diameter 100mm, tread width 40mm, overall height 164mm. Load capacity 460kg.